The construction of the Siberian railway - the Great Siberian Way - is the second discovery of Siberia after Cossacks. "It has happened! The old Siberia has left behind! Something new has come to us!" - was written in the Irkutsk paper "Eastern Survey" on the 16-th of August 1898. The question of the construction of the railway was often raised by Siberian governor-generals, merchants and industrial workers, especially after annexation the Amur river to Russia in 1868 and opening ports in the Pacific Ocean. But only military and strategic reasons caused the construction of the main line. On the 17-th of March 1891 Czar Alexander the Third signed a rescript for building the Great Siberian railway. The Trans-Siberian Committee was formed to control the process of the construction. The plan based on the proposals of S.U.Vitte, the Minister of Finance, and it was thorough worked out. However, strict terms were laid down: "The Great Sib. railway had to be built only by Russians and with Russian equipment. And it was kept to. A lot of coal deposits were opened along the railway during the construction of the line. At the same time many railway stations, depots water towers, workshops, churches, schools and hospitals had been built. The main principle was "to build firmly for not to rebuild again." 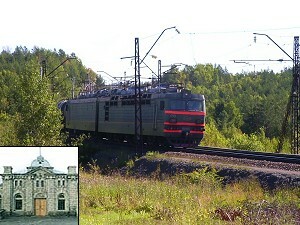 In 1900 the line from Moscow to Vladivostok	became operational. But there was no railway to bridge the gap between the middle Siberia and Trans-Sib. railways. So, until 1904 passengers crossed Lake Baikal on ferries. For the transportation of carriages a specially designed combined icebreaker named Baikal was ordered. It was the largest icebreaker in the world and it could smash through ice up to 4 feet thick. The ferry system was not a great success, however. The Trans-Siberian Committee realized that however expensive it might prove The Circum Baikal Loop (Circumbaikal / Roundbaikal Railway) had to be built. In 1901 10000 labors started to work on the line. It was the most difficult to build on the rocky terrain. Working as fast as possible in all weathers. The Circum Baikal Loop was completed in 1904 at a cost of 70 million rubles. In 1905's a short cut was opened between Irkutsk and Sludyanka. The line between Irkutsk and port Baikal is now flooded and no longer exists. Much of the port Baikal to Kultuk section is still operational and can be visited by boat from Listvyanka. At present it is the territory of the Baikal National Park. The building of the Railway Station in Sludyanka made of white marble. Over years it became sooty because of boiler-houses in the town. The Great Siberian main line is the longest one in the world. It stretches for 10 000 kilometres. It had been built for 13 years. All	together there are 80 kilometres of railway bridges erected over the rivers. Its fame spread all over the world. Exhibited in Paris in 1900, it made a great impression on the audience. In honor to the construction of the way it was decided to put 3 monuments in St. Petersburg, Irkutsk and Vladivostok. The model of the first Siberian express train is exhibited in the Hermitage in St. Petersburg. Its wagons are made of gold and the locomotive is of platinum. The model of the icebreaker Baikal is also in St. Petersburg. Planning a trip by Trans Siberian railway?